On Halloween night 1938, Orson Welles broadcast a radio adaptation of the H. G. Wells fantasy, The War of the Worlds. What listeners heard sounded so realistic that at least a million were frightened by word that "strange creatures" from Mars had landed in central New Jersey and were "unleashing a deadly assault." Several thousand were so terrified they ran into the streets, drove away in their cars, or called the police for information about how to escape. Why did so many panic when the circumstances reported were so improbable? That is just the question Hadley Cantril, then a young social psychologist, set out to answer. 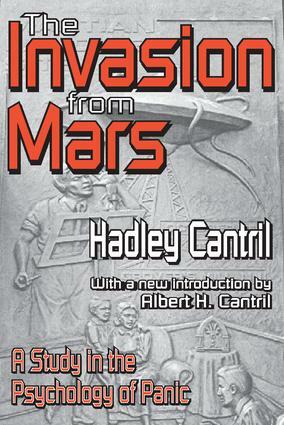 Originally published in 1940, The Invasion from Mars remains a classic. The broadcast provided a unique real-life opportunity to explore why the relatively new medium of radio could have such an effect. Using a mix of research methods, Cantril shows that the impact of the broadcast had less to do with what went out over the air than with the "standards of judgment" people did or did not use in evaluating what they were hearing. This book is of continuing value to those interested in communications and mass behavior. "Incredible as it may seem"
"It didn't sound like a play"
"Being in a troublesome world"
"Jitters have come to roost"